IRVINE, Calif. (AP) — By bus, by freeway or on foot, candidates dashed across California on Saturday in a frantic rush to secure votes, knocking on doors, dialing phones and urging throngs of volunteers to fight for every vote. Nowhere were the stakes higher than in Southern California’s Orange County, a one-time Republican stronghold where Democrats are trying to claim as many as four GOP-held House seats. Those districts figure prominently in the party’s national strategy to seize at least 23 seats on Election Day to retake control of the House. In the closely fought suburbs of the 45th District, comedian Chelsea Handler kicked off a rally for U.S. House candidate Katie Porter, who is trying to unseat Republican Rep. Mimi Walters. The boisterous rally in a hotel ballroom was headlined by Lt. Gov. Gavin Newsom, the Democratic candidate for governor, who described the election as a proxy vote on President Donald Trump’s administration. He urged the crowd to send a message to the president about his agenda: “We reject it,” he said, setting off a thunderous cheer. Porter, a law school professor, said Walters had turned her back on the county and its residents, pointing to her votes against the Affordable Care Act. “Show her the door,” she told them. Kim urged a crowd of cheering supporters waving signs to get to the polls or mail in a ballot as soon as possible, warning them, “It could be your vote” that makes a difference on Election Day. “It’s all going to come down to a few votes,” she said. 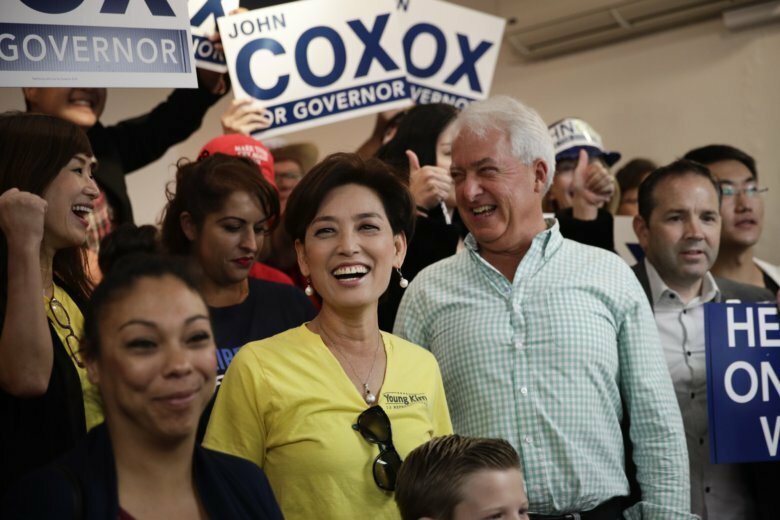 She also urged support for Cox, who has been trailing Newsom in polls and fundraising in a state where Democrats hold every statewide office, both chambers of the Legislature and a 3.7 million edge in voter registrations. “Can you imagine Gavin Newsom being our governor?” she asked, eliciting loud boos and shouts from the crowd with the mention of the Democratic candidate. Cox said residents are suffering from too many taxes, on fuel, on food. “This campaign is about saving the state of California,” he said. “This state has been made unaffordable and unlivable” under Democratic leadership, he said. The competing rallies showcased the stark political divide in the nation’s largest state, where the population has become more diverse and the politics more firmly Democratic. Trump lost California by over 4 million votes in the 2016 election, and independents now outnumber Republicans in the state. Kim, a former legislator who worked for Royce for years, is running as a Trump supporter with an independent streak. But she has been cautious about mentioning the president at a time when polls show college-educated women are fleeing Trump’s GOP. She never mentioned him in her remarks at the rally. “We are in it to win it,” she told her volunteers.